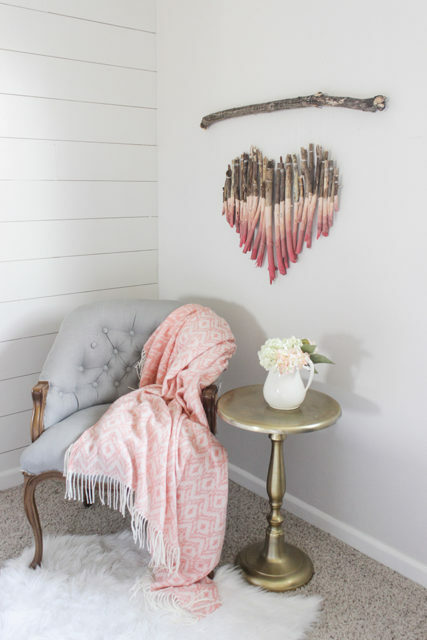 There is nothing I love more than discovering easy and adorable decorations for my home. 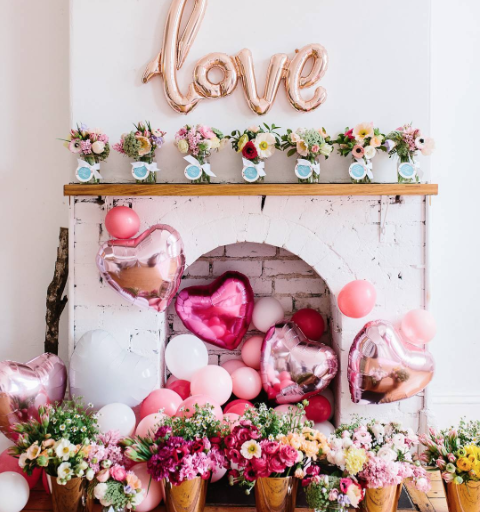 This Valentine’s Day decor round up has some gorgeous ideas for easy DIY decorations that you can do on your own with minimal effort. 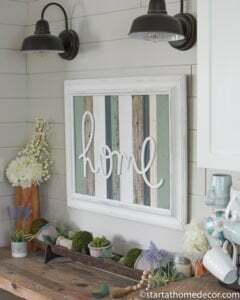 I love this mantel from Random Thoughts Home! It is so elegant in its simplicity. And, the hints of red make everything really pop against the white backdrop. Looking for some kind of floral display? This idea from Evolution of Style is genius!! 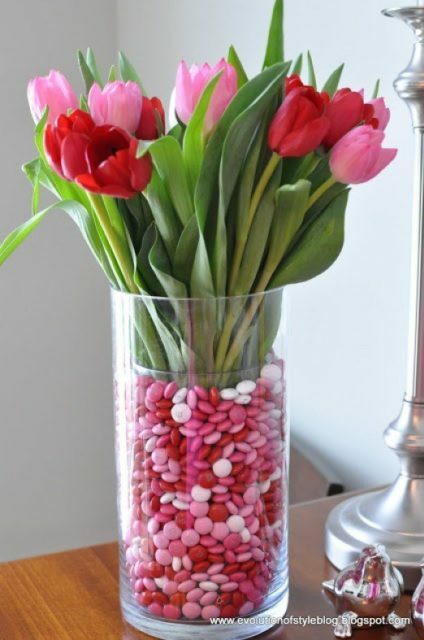 I love the beautiful tulips complimented by the coordinating candy colors. I think my kids would love this centered on our table! How cute is this table? 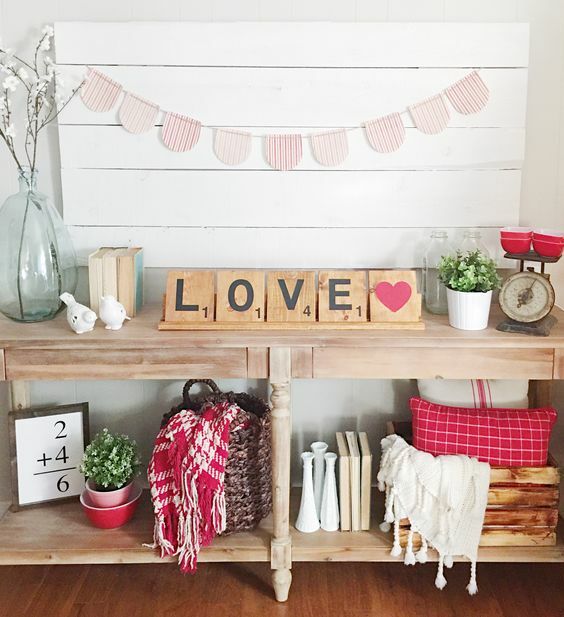 I couldn’t find a source anywhere listed for this picture, but I just love the pops of red with the Scrabble Love. This one may look familiar. 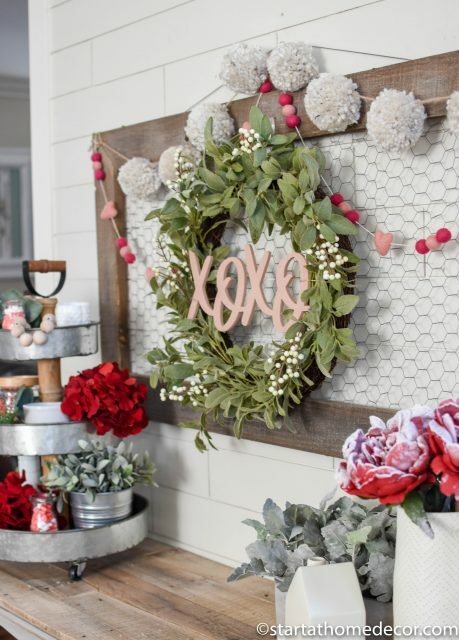 The simple wreath is a great focal point, accented with garlands like this Valentine’s one and my XOXO cutout. I also added in my tiered tray and filled it with red, pink and white items. 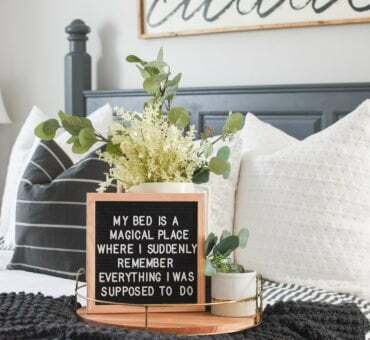 Here is another adorable set up from Hobby Lobby. I’m pretty sure that if this was on display at my house, my girls would be all over that pink. Isn’t that ladder display so fun? This source was also unlisted, but it is too cute not to share! 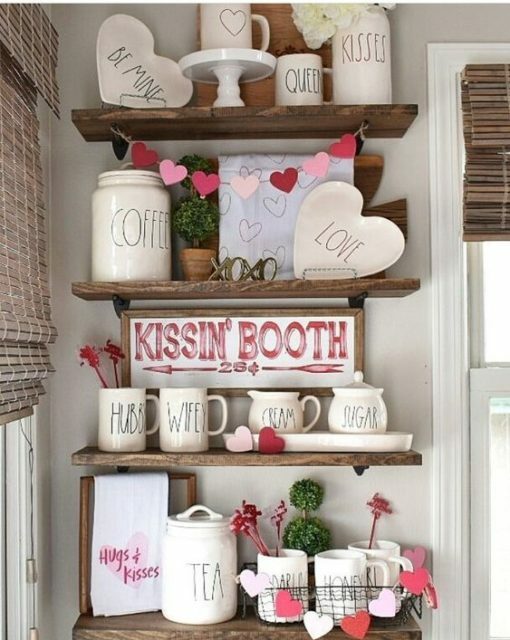 I love the Valentine’s Day decor on the open shelving. It presents such a fun display! If you like something a little more unique, this elegant art display is amazing! I love the the fun texture and coloring that the branches create. What a gorgeous little nook from Shades of Blue Interiors. 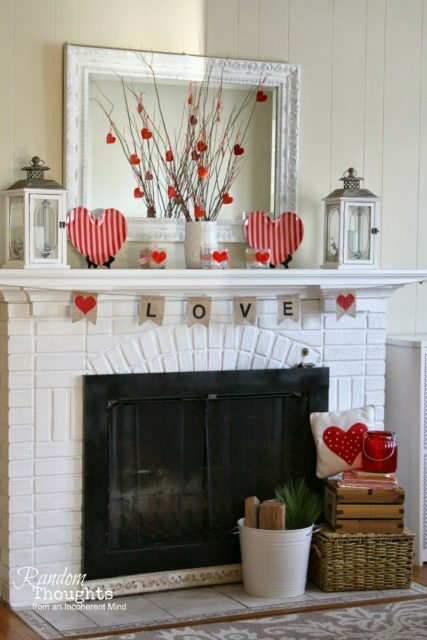 And I have to throw in another of my Valentine’s decor ideas here. I absolutely LOVE these free “I love you” printables that I designed for my space this year. And these new garlands are super adorable as well. I picked up this one from Target and the other I made. You can grab those free printables here. 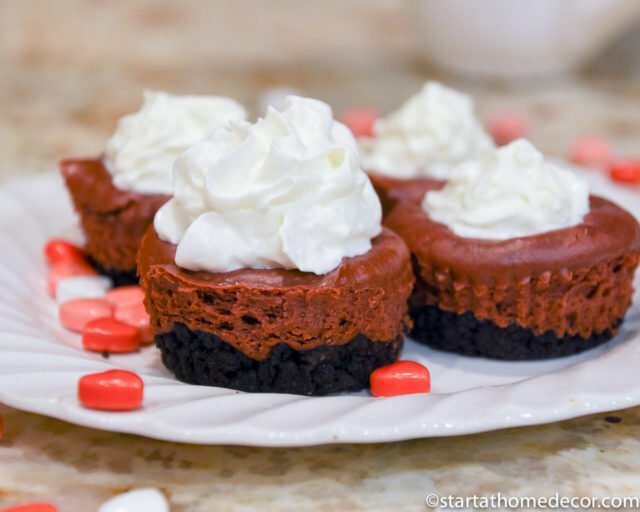 Looking for a fun Valentine’s Day table setting? 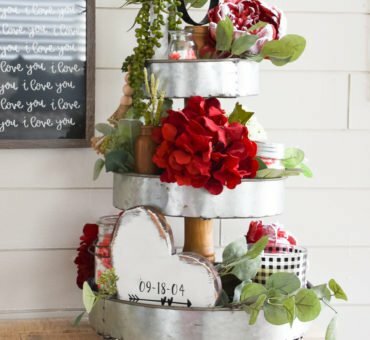 This super cute and EASY table decor from Arin Solange is amazing! 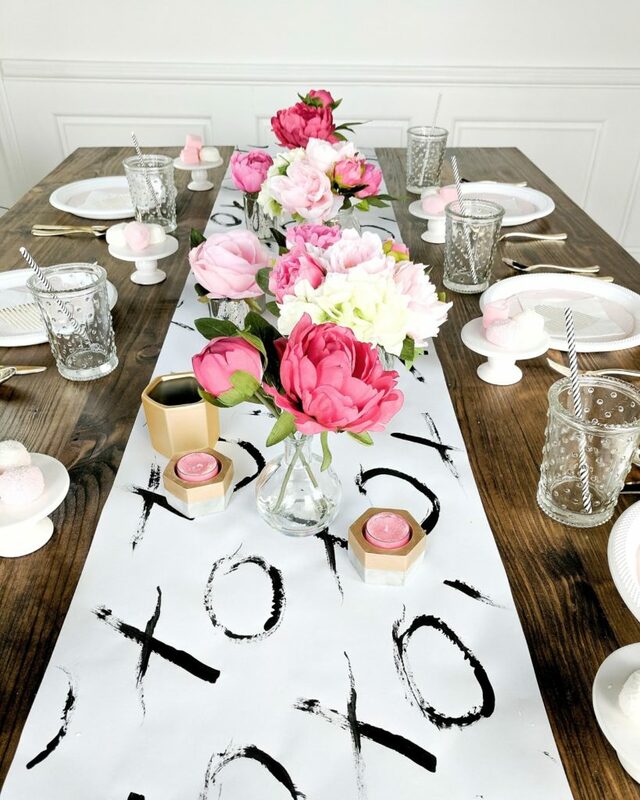 I love the DIY table runner with the painted XOXO on it accented by the bright flowers. 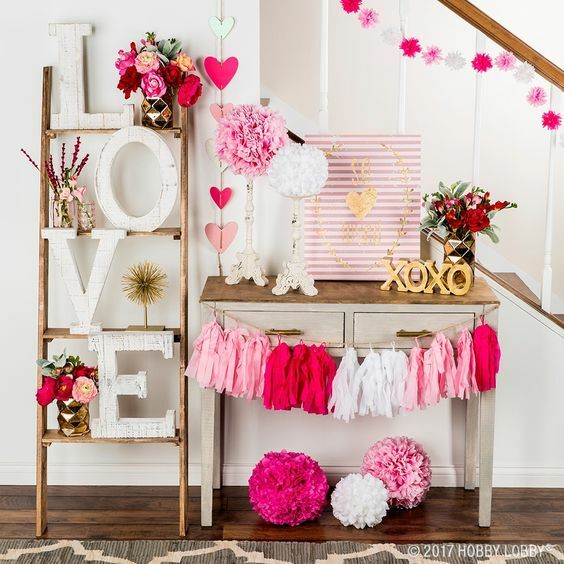 Isn’t this a fun Valentine’s Day display? I love all of fun balloons, especially above the fireplace and inside of it. 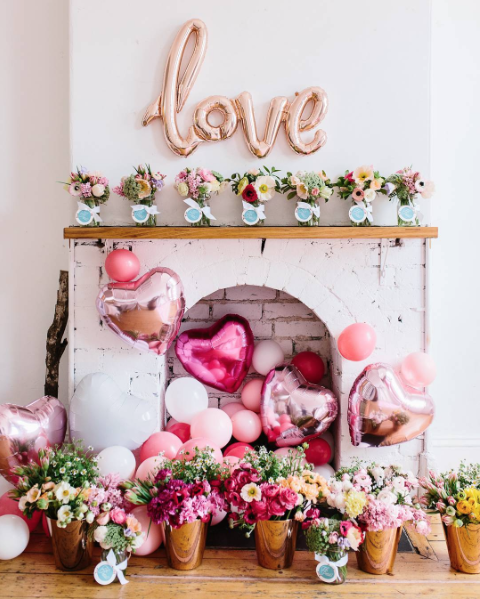 How creative to style the balloons this way!! 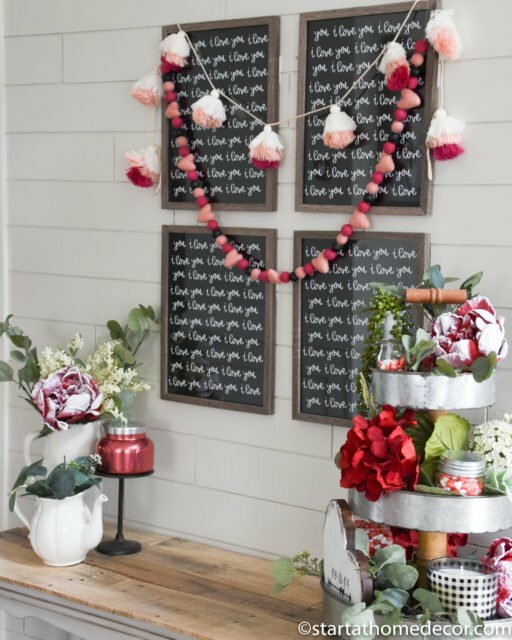 These ideas for easy Valentine’s Day decor are so fun and creative, I hope you will also give one or two of them a try! Thank you so much for joining our community, we are so excited to have you! Just one last step, head over to your email and confirm your subscirption! After all who doesn't love a FREE E-Course!! FUN Felt Letter Board Sayings! Hi, I am Brooke from Start at Home. I am a stay at home mom to 3 cute little kiddos and an avid DIY’er who is always up for a challenge. 6 years ago my husband and I bought a fixer upper, and little did we know it would change our lives forever. Since then I have taken over the garage with all my furniture, odds and ends, and paint. It is now known as my “hobby” that is out of control! 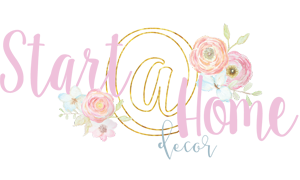 I love to blog and share my every day experiences as well as showcase my love for furniture and interior design. 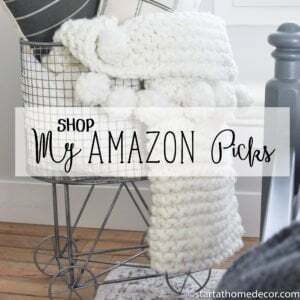 What started out as a way to furnish my home has snowballed into a small, ever so small business! I never expected to be where I am today but I am enjoying the ride, and trying to keep up! !